BendPak two-post lifts feature low-pressure HVLP direct-drive cylinders, eliminating the need for lifting chains or screw mechanisms most commonly found on other lift designs. Dual HVLP low-pressure cylinders minimize leakage and offer better reliability, smoother operation and less maintenance costs throughout the life of your lift. High-volume, low-pressure equates to less workload placed on the entire hydraulic system. 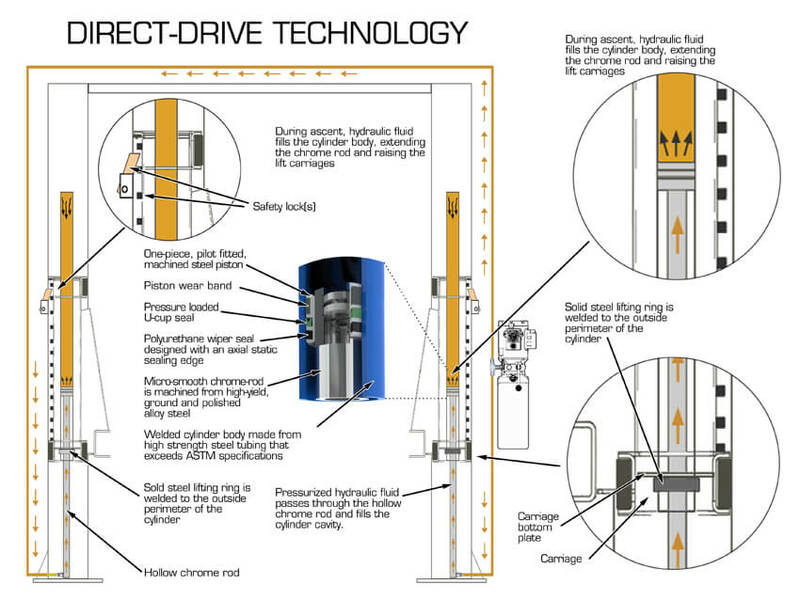 Direct-Drive technology is preferred on commercial-grade two-post lifts, as it has it has fewer moving parts than a chain-over roller configuration. Pressurized hydraulic fluid flows from the power-unit, through the hollow cylinder rods and into the cylinder body, filling the inside cavity. The pressure of the hydraulic fluid forces the piston rod to extend downward, raising the cylinder body and lift carriages. A dual-synchro equalization system maintains equal lifting and provides operators with a stable, level vehicle working condition.